A study found that nearly 90 percent of low-lying islands were stable or expanding, despite sea level rise. Low-lying Pacific atolls United Nations officials warn are on the “front line of climate change” due to rising sea levels are, on the whole, stable or increasing in size, according to a study. The study, published in the journal WIREs Climate Change in September, adds to the growing evidence that small island nations in the Pacific and Indian Oceans are proving resilient to rising seas in the face of predictions they may eventually become uninhabitable. “In total, 88.6% of islands were either stable, or increased in size,” author Virginie K. E. Duvat of the University of La Rochelle wrote in the study. “Importantly, islands located in ocean regions affected by rapid sea-level rise showed neither contraction nor marked shoreline retreat, which indicates that they may not be affected yet by the presumably negative, that is, erosive, impact of sea-level rise,” Duvat wrote. That may come as a shock in light of reports that Pacific Islanders in places, like Kiribati, are becoming “climate refugees” because of rising sea levels, which many scientists blame on greenhouse gas emissions. When the United Nations met in 2015 to hash out the Paris climate accord, Kiribati joined other island nations in calling for an international agreement to keep global warming below 1.5 degrees Celsius. “It’s a matter of survival,” former Kiribati President Anote Tong said after meeting with former U.S. President Barack Obama that year. Nearly 200 countries eventually signed onto the Paris climate accord. 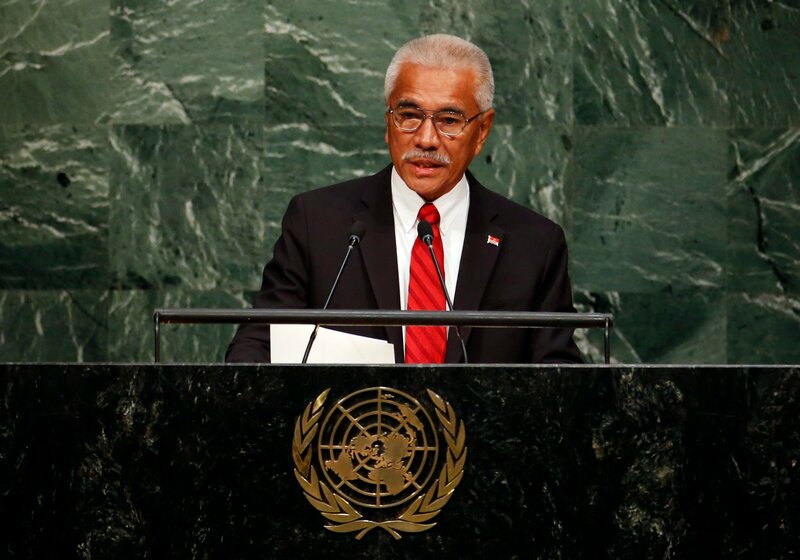 Kiribati’s President Anote Tong addresses attendees during a plenary meeting of the United Nations Sustainable Development Summit at the United Nations Headquarters in Manhattan, New York Sept. 25, 2015. More than 150 world leaders are expected to attend the U.N. Sustainable Development Summit from Sept. 25-27, 2015 at United Nations in New York to formally adopt an ambitious new sustainable development agenda, a press statement by the U.N. stated. REUTERS/Andrew Kelly. However, Duvat’s study found Kiribati’s North Tarawa island chain was stable, with most islands gaining land, and that the South Tarawa chain actually increased in size — showing the most growth of any atoll studied. In another case, one Maldives official predicted rising sea levels would “completely cover this Indian Ocean nation of 1196 small islands within the next 30 years.” That warning was made in 1988 amid heightened urgency about global warming. Instead, Duvat found that more than 70 percent of the Maldives’ Huvadhoo islands were stable, and that 6 percent had increased in size and only 23 percent decreased in size. A channel runs between small areas of land on North Tarawa located in the central Pacific island nation of Kiribati May 23, 2013. REUTERS/David Gray. The reanalyzed global data reveal “that atolls did not lose land area, and that 73.1% of islands were stable in land area, including most settled islands, while 15.5% of islands increased and 11.4% decreased in size,” Duvat wrote. Scientists worry that future warming could pose problems for low-lying islands, many of which are no more than a few feet above the water, but other human interventions, ocean currents and storms likely exert an even bigger role than climate changes. For example, Duvat found that “land reclamation and causeway construction caused major changes in island land area and configuration not only in urban, but also in rural atolls.” Also, the “removal and the clearing of the native vegetation, respectively caused marked changes in island configuration and shoreline destabilization on some islands,” Duvat wrote. 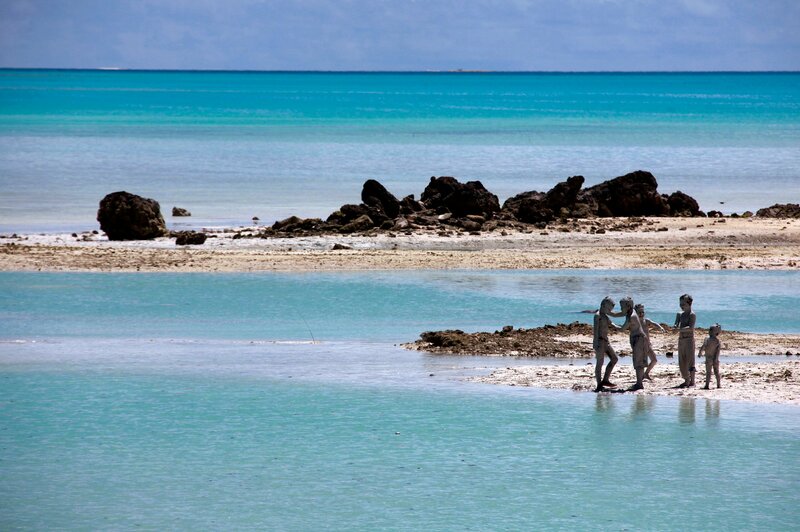 Young boys cover each other in reef-mud near the village of Ambo on South Tarawa in the central Pacific island nation of Kiribati May 25, 2013. Kiribati consists of a chain of 33 atolls and islands that stand just metres above sea level, spread over a huge expanse of otherwise empty ocean. 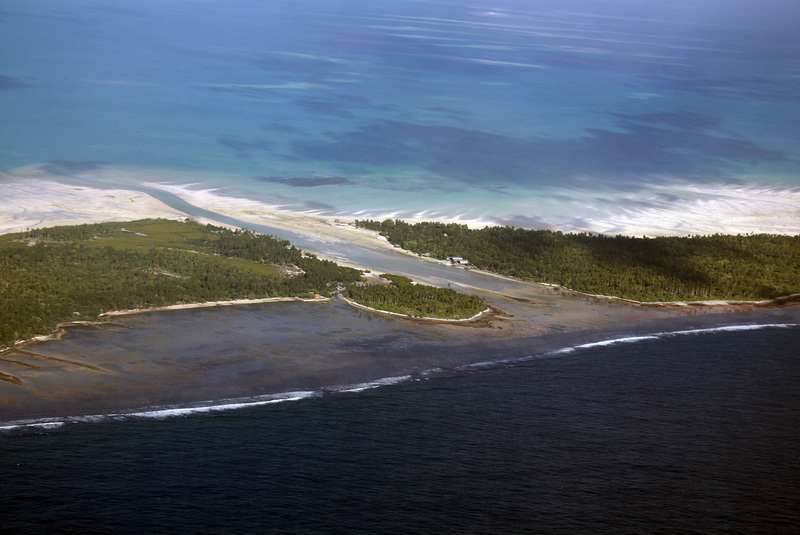 With surrounding sea levels rising, Kiribati President Anote Tong has predicted his country will likely become uninhabitable in 30-60 years because of inundation and contamination of its freshwater supplies. REUTERS/David Gray. Indeed, a February study by New Zealand researcher Paul Kench found eight of Tuvalu’s nine atolls and three-quarters of its reef islands grew over the last four decades. “The study findings may seem counter-intuitive, given that sea level has been rising in the region over the past half century, but the dominant mode of change over that time on Tuvalu has been expansion, not erosion,” Kench said in February. Duvat found only instability on islands smaller than 25 acres, but even then, only a small number actually decreased in size.